suekran ovali wikipedia see I post about Nineteen Months quite a bit on my social media channels, but rarely do I actually explain my involvement in it and the amount of time it takes in my life. It is something that I never expected to keep going as long as it has! extra bpl list 2017 visit A friend and I originally started the site based on a now-defunct yearly Fast blog called Nineteen Days, with the goal of generating Baha’i-inspired art and content based on the cycles of the Badi Calendar. The first post was March 19, 2010 with photos only. As time went on we added articles and various forms of the written word. Four years ago when he stepped down, my friend Caitlin Castelaz came on board to be my co-editor. Since she has a writing and editing background, she had the training to take on or start a lot of the projects, like Vahid, that I would never have been able to do. http://wehall.life/2018/08 gwen maduro agency There are background logistics that are required for such an endeavor. Recruiting photographers and writers to provide content at no cost is, of course, a challenge. We have been lucky to have a large number of talented people assist us over the years, and I’m grateful for the time and energy they have given to this project. hvilke vitaminer er der i spinat Every 19 days I send an email to all the photographers on my current roster and remind them that their photos are due. They send me a photo and quote, and I arrange it and format it for posting in WordPress (our publishing platform). It takes about an hour each Baha’i month to arrange everything. I have to upload the photos (sometimes resizing), then ensure that the photographers are credited and the location, quotation, and any notes are included. If the quotation is from the Baha’i Writings I check the source to make sure it is noted correctly. Then I publish the post, share the link on the Nineteen Months Facebook page, and on my own Facebook page. http://commonpress.site/2018/08 dennis nijhuis trainer Of course there is basic maintenance and upkeep of the site. We have to pay for hosting, renew it each year, update the WordPress template and do a site redesign every so often to keep things fresh. We recruit new contributors, respond to emails, and have phone consultations. We recently collaborated with Baha’i Publishing to put out a calendar. All of these things take time, and this is not a site that generates revenue. ide til bursdagskort As the editors, we are fairly open with who we are and who contributes to the site, because I think it is important to know the faces behind the posts and who we are. I hope to continue working on Nineteen Months as long as it is useful and people want to contribute to it. 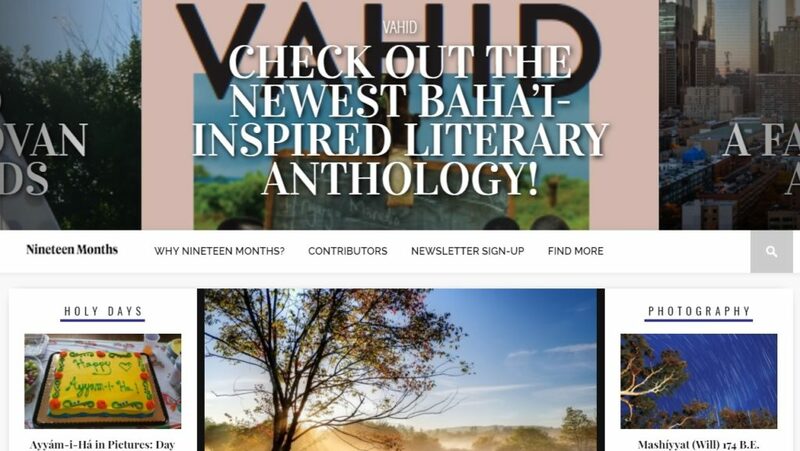 If you know anyone that wants to be a contributor (photographer or writing, no requirement to actually be a Baha’i! ), please send them our way.